The world’s attention is unfortunately, but understandably, regularly focused on the destructive force of natural events like hurricanes, tornadoes, earthquakes, and tsunamis, as well as on the violent human forces contending in conflicts in Central Europe, in the Middle East, in Africa, and in Latin America. In addition, we cannot help but be disturbed by so many forces intimately at odds with us: the aggression of temptation and sin, the debilitation of illness, the pain of emotional wounds, the intensity of the passions, and the assaults of demons. Indeed, the three enemies of our human nature–the world, the flesh, and the devil–are forces at war with us, striving to turn us away from Jesus and his saving Gospel. Yet, these negative forces are no match for the positive power–the Good News of Jesus. Yes, his grace, his presence with us, his provident love for us, is the greatest power in the universe–and no evil force can overcome him. That is the consoling message of the readings our Mother the Church offers for our meditation this Sunday: “Take courage, do not be afraid!” The power of God’s gentle mercy is greater than any opposing force. At first reading, today’s passage looks like one story, but in fact several stories are woven into it, and we cannot meditate on them all at the same time. We therefore separate the various strands and focus on one at a time. We might eventually find a link between them (the early Church did hand down the passage as a unity) but if we do find the link, it must happen spontaneously and in its own time. In our meditation we choose our perspective. We can focus on Jesus, the ideal leader, parent, friend, spiritual guide; he is also the model of the Church in the world, and indeed of any alternative community which brings hope to the rest of humanity. On the other hand we can focus on those to whom Jesus ministers – the disciples, the crowd, St Peter. They are ourselves when we have a deep experience of grace and salvation. – Verses 22-23. Jesus sends away both the disciples and the crowds so that he can go up on the hills by himself and pray. This is the moment when those of us who have authority over others feel the need to get in touch with our deepest selves. We are able to distance ourselves from those we have responsibility for. By doing this we also give them the space to find themselves – an essential aspect of exercising authority. Even though, like Jesus, we end up having to go and rescue them, it is still a moment of growth – for them and for us. – Verses 24-25. Jesus becomes aware (because he was at prayer?) that the disciples are in crisis; their boat is far out on the lake, they are battling against a high wind, he walks on the water to meet them. This is a deeply symbolical act in the bible, since the Jews saw the sea as evil, the dwelling place of terrifying monsters. 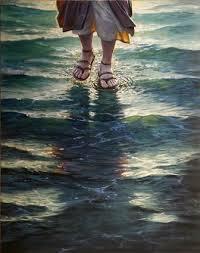 Jesus walking on the water then, especially in a storm, is a deeply moving picture of the good person walking boldly and confidently into an evil environment. Here again we can make the link with verses 22-23 – it was because he was faithful to his times of solitary prayer that he had the power to walk on the water. – Verse 26. The focus shifts to the disciples. When they see Jesus they are terrified, thinking “it is a ghost”, but he encourages them. We too when we panic, become suspicious and fearful even of goodness; only gradually do we recognise that it is a moment of grace. – Jesus is the ideal leader and guide. The story reminds us that great leaders have the capacity to bring out the best in people – make them feel that they can step out and go beyond their usual limitations to do great things. A striking picture of the role of the Church in society. – Peter represents us when we take a bold step and then once we have stepped out become afraid. 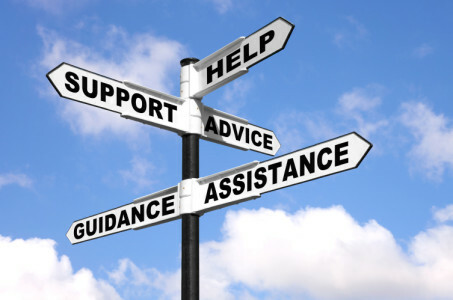 Jesus the true friend challenges but does not reject – he continues to offer Peter his support. – Verse 33. The climax of the story. Jesus finishes the task he set himself – he gets into the boat and the wind drops. We must avoid an escapist interpretation. 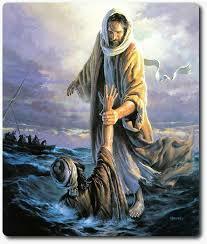 Jesus does not always calm storms, what he always does is convey the message that he has power over the forces of evil. The disciples experience the victory of goodness over evil, grace over sin, life over death. It is a moment of rest, of “blessed assurance” – “the wind drops” – and of security – “Jesus gets in the boat”. They know they are in the presence of God, so they “bow down before him”. so that we can go up to the hills by ourselves to pray. far out on the lake and battling with a heavy sea and a head-wind. Lord, our civilization is going through a great crisis. battling with a heavy sea and facing a head-wind. and to create alternative institutions. even though it means walking on the water. trusting only in your love and your truth. Lord, we thank you for the great people you send us on our life’s journey. we think it is a ghost and cry out in fear. and at once they put out their hands and hold us. to experience that you have put out your hand and held us. Lord, we pray that Jesus will be our model in our work of spiritual guidance. help us rather to put out our hands at once and hold them. We live in a world that is shot-through with the glory of God. The Father has made us for himself that we might praise him; the Son has come among us to lead us towards the fullness of life; the Spirit dwells within us to enlighten our minds to the mystery that is greater than all we can see, touch, and taste. Part of living a Christian life is becoming attuned to this presence. This is the focus of our reflection today as we gather to en­counter Jesus in our common meal. But in this encounter we recognise that God is greater than all creation and is the very source of our being. 1. How do we learn to be Christians? The most common an­swer to that question is to say something like this: ‘I will study the teachings of Jesus and see if I believe them. If I think they are true, I shall then be a believer’ (while subcon­sciously adding: and if I call myself a believer in Jesus’s mes­sage, then I will be called a Christian). 2. The problem with this is that Jesus is not just a religious wise man who offers us teachings. We do not simply believe his teaching, we believe in him. To believe in him is to believe that he is the Anointed, the Son of God. We do not simple be­lieve that what he said is true, but we believe that he is the truth. 3. The church’s message is not just a set of teachings that he has given us; the teaching of his followers is that Jesus is the mes­sage of the Father to all humanity. Our teaching is Jesus: that he is the Christ. 4. The task we face is to learn to live in Jesus, to live in a style that is consistent with affirming our basic teaching as Christians: that Jesus is the way to the Father. 5. This is the challenge that lies behind today’s gospel. It is not just enough to listen to Jesus, we have to get out of our security zone and go to him, to commit ourselves to him, to trust him. To learn to be a Christian is to learn to behave with an obedi­ent trust that amidst life’s difficulties and fears, he is the sav­iour. 6. The challenge of the gospel is not to ask whether you think it happened, or indeed whether or not you think it could hap­pen. Such questions are not questions about faith, but about history or physics. The challenge is that each of us, and all of us as a community, has to be prepared to leave our boat and venture toward Jesus. It is only in going toward him in trust that we discover who he truly is. 7. In a moment we will stand up and profess our faith. Note that we do not subscribe to a series of teachings or ideas which we might call ‘the teachings of Jesus’. Rather, we pro­fess that we believe in Jesus, and we believe him to be the Son of God in union with the whole church. We believe him to be the Son who has shown us the Father, and who has sent us the Spirit who gives us life. 8. Now, let us assert together through the power of the Spirit, who transforms us from being a bunch of individuals in the church, that we are the people who believe that Jesus is the Christ, the Son of God, who comes from the Father. Fear is very basic to our human condition. We are often full of fears, some of them irrational. So it might seem that, having just witnessed Jesus miraculously feed more than five thousand people (see Mt 14:15-21), Peter and the others were being irrational by expressing fear and anxiety when, in the midst of a storm at sea, Jesus walked towards their boat that was being tossed about by the wind. But Peter was learning. His fear at finding himself in such a precarious position in the boat, while Jesus had gone up into the hills alone to pray, was somewhat abated when the apparition approaching them and, filling them with fear, offered this reassurance: ‘Courage! It is I! Do not be afraid’ (Mt 14:27). Peter was able to muster sufficient faith to respond: ‘Lord, if it is you, tell me to come to you across the water’ (Mt 14:28). This was indeed a leap of faith. Already filled with fear at finding himself in the middle of a stormy sea in a small boat, with only other terrified followers of Jesus for company, Peter asked for no proof that Jesus was who he said he was. Peter sought a command that would permit him to exercise his faith. Nonetheless, having bravely made this initial act of faith, Peter then began to doubt. The wind was raging around him and the waters were turbulent. He began to sink, and suddenly cried: ‘Lord! Save me!’ (Mt 14:30). The lesson for us here is that there is an ideal to follow when our own faith begins to crumble. It is better, of course, not to doubt. Indulging in doubt has always been considered to be sinful by the Church. But if we fall, if we allow ourselves, like Peter, to doubt the power of Jesus momentarily — even to calm stormy seas — then let us immediately acknowledge that same power by asking for salvation, as Peter did. Jesus responded to Peter’s cry for help by stretching out a saving hand, while at the same time rebuking him for doubting:‘Man of little faith, why did you doubt?’ (Mt 14:31). institution, then we will be full of fear when it is tossed about on the winds of fashion and controversy. We will begin to doubt as Peter doubted. In that case, we must be prepared for the same rebuke given to Peter. The truth is that Christ is in charge of his Church. Because of that, there is no reason for us to doubt. All that God asks of us is that we are faithful to him and to the teachings of his Church. Matthew’s account of this miracle concludes with the news that when they were all gathered together in the boat, with Jesus, the storm ceased. When they recognised his power, calm was restored. institution. It relies on supernatural help to achieve its mission which is the salvation of the whole world. There is no need for us to be fearful. A most strange gospel story – Jesus walks on the water. It’s the type of gospel that suits a decision time, challenging us into deep trust – an invitation to come to the water; not to be afraid. 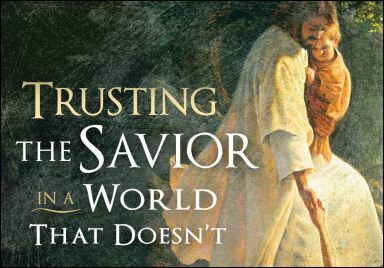 It’s about trusting in Jesus, when there is nothing else. If you have human help, it’s great – but not the same as trusting in God. In time of death, the call is to trust in God’s promise, because he is the way and the truth. Old age can be the same, or times in life when we just don’t know what the future will hold. It sounds unusual, but what Jesus does in this situation is very human. He doesn’t lecture or say a prayer, he just holds hands. Someone was given a book on bereavement after a family death – he said he needed a hand to be held, or his tears to be heard. That’s Je­sus. He held Peter. God is a God with skin, with a human heart, and leaves big ideas behind when we are in trouble. Jesus just went across the lake, stopping his comfortable prayer. There are times when we just need to hold on to God in trust. On another occasion Peter would jump into the lake again – after the resurrection. Always a water man! Then he would be asked not just to hold a hand, but to be the hand that would reach out to others. Peter was prepared for his mission in many ways. As Pope Francis says, ‘When the Lord wants to give us a mission, wants to give us a task, He prepares us. He prepares us to do it well’ (June 2014). In Matthew’s Gospel, the storm at Gennesaret and Peter’s walking on the water immediately follows the multiplication of the loaves and fishes. The depth of Peter’s love for Jesus is not matched by a depth of faith; but Jesus, nonetheless, raises the sinking disciple up from the waters of fear and death. Throughout the Gospels, Jesus intentionally withdraws from his friends and followers to be alone; but such times are not for “chilling” or “vegging” but for attentive, focused prayer, to be in touch with the rhythm and movement of God. God calls us to our own out-of-the-way places, our own quiet “mountains” to be fully aware of God’s presence in our lives and hearts. What happens to Peter in today’s Gospel, happens to all of us at one time or another: We panic. We don’t trust ourselves to know what the right thing is or our ability to do it. But, somehow, God reaches out and catches us — if we’re willing to put aside our fears and try to do as Jesus would do, trusting in God’s grace to realize that good. 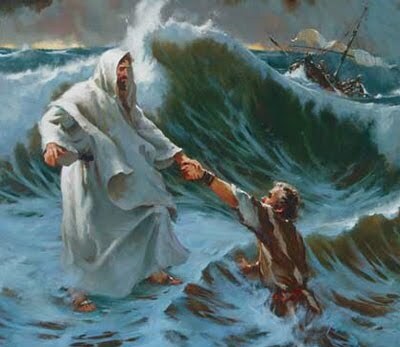 Jesus promises that in every storm that batters us his hand is extended to us in the hand of those we love and trust; he also calls us to grasp the Peters in our midst who struggle not to be overwhelmed by the waves of fear, doubt and alienation that often threaten to drown all of us. In her book Hope Will Find You, Naomi Levy tells of the wisdom she has learned from her daughter Noa, who struggles with a debilitating degenerative disease. We tend to approach prayer as either trying to wrest what we need from an unwilling God or the reciting of formulas that express our religious identity. 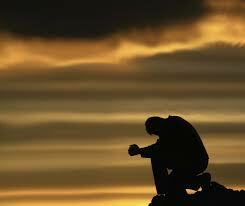 But prayer is to recognize God’s love in our lives, to find our bearings in the life of God. Little Noa understands that: her morning prayer helps her focus on God’s presence in her every struggle of her day. Just as Jesus withdraws to the mountain at the beginning of today’s Gospel, we, too, need sacred time where and when we can withdraw to listen to the voice of God in the quiet of our hearts, to know the joy of doing simple, humble things for others. Jesus invites us to find spaces for prayer and make quiet time in our days in order to re-center our lives in the reality of God’s love, to hear again God’s voice calling us to lives of joyful gratitude and meaningful service. In the first reading we meet Elijah the prophet hiding in a cave as he tries to distance himself from Queen Jezabel who is out to get him because he has humiliated and killed her prophets. Now on the run for his life, he is directed to Mount Horeb where he takes refuge in a cave. He wants to meet God and wishes this God to act powerfully against his enemies. There he discovers that his tactics are not God’s tactics. God’s approach is a non-violent one, symbolized by the mighty wind and earthquake in which he does not find God. Rather it is a gentle one, symbolized by the gentle breeze. Our God is so different from what we expect! In today’s gospel, we read that Jesus sent his disciples in a boat and he went on the mountain and was praying until three in the morning. Later, Jesus walked over the water and found His disciples fighting a losing battle against the storm. Though He was present fear engulfed them. His presence calmed the sea and gave them freedom from fear. The lesson in this passage is abundantly clear. As Matthew relates it, the story is clearly symbolic. The disciples in the boat represent the infant church; the wind and the waves represent the persecution let loose on the Church. Jesus is not with them physically; He is in heaven praying to the Father. However in the Church’s direst need, when all seems lost, her Lord comes to save her, The incident of Peter sinking and being saved by Jesus is probably a reference to Peter’s failure during the passion, and his restoration after the resurrection. In any case Peter represents the typical disciple, caught between faith and doubt. Jesus’ rebuke, “Man of little faith! Why did you doubt?” is directed to us also, who often start out courageously only to lose heart when faced with a crisis. Mark Link tells the inspiring story of a 17 year-old girl named Joni Eareckson, who like all teenagers her age was full of vitality, vigour and promise. Her favourite sport was horse riding, and in every completion her performance was so very impressive that her prospects for the future kept rising both noticeably and dramatically. One hot afternoon in July, Joni went for a swim in Chesapeake Bay and there tragedy struck. On one particular dive she sustained such a severe injury to her head that she was instantly knocked unconscious and rushed to the hospital for emergency treatment. And there the worst fears of her loved ones were confirmed. Joni would be a quadriplegic for the rest of her life. The months ahead were an absolute nightmare, with just no light at the end of the tunnel. The once graceful rider, who delighted crowds with her performances, would lie strapped to a Stryker frame. And for much of her time she would lie with her face down, looking at nothing but the floor. That is when she had a spiritual experience. As Joni lay strapped in her Stryker frame, she thought of Jesus nailed to the cross. He was God yet he was totally powerless and helpless. And she adds, “I pictured Jesus standing by my Stryker frame and saying to me, “Don’t lose heart, Joni, for I am with you and will help you to achieve the impossible.” Even as she lay there a curious thought crossed Joni’s mind. She could attempt painting if she could hold a painting brush between her teeth. And that is precisely what she did- so successfully and admirably that she is author of two best-sellers –one being autobiographical and entitled Joni –and has played the lead role in a movie of her own life. This inspiring story aptly demonstrates what Jesus can do in the life of any and every individual, if we let him. As the saying goes, “Where some see a caterpillar, others see a butterfly.” As someone has rightly said, “We must let go, and let God.” This precisely is what Joni did in her absolute helplessness. But with faith in the almighty power and the never-failing help of the Lord Jesus, she was able to achieve the impossible. The God-encounter is possible when one dives deeper, climbs higher, ventures further and ‘burns one’s boats’ to launch out into the deep. The conquistador, Hernan Cortes (1485- 1547), was an ambitious man and desired to conquer Mexico for King Charles V of Spain. Frightened by unknown lands and its many inhabitants, his sailors dreamt of turning back to their ships, whereupon Cortes ordered them to ‘burn their boats.’ Are you ready to burn your boats and launch out into the deep to meet Deep? Peter’s encounter with Jesus becomes a model of the Church’s encounter with God. Life tosses us about and makes us scream, “Help!” Rather than saving us by shortcuts, Jesus appears in life’s storms saying, “Courage, it is I!” His invitation follows: “Come!” Are we ready –as individuals and Church – to jump off the boat, leave the bandwagon and abandon the crowd? The Indian state of Gujarat suffered devastating floods in July 2005. The oldest Church in Gujarat, at Anand, was inundated like never before. This “Church in deep waters” is symbolic of the Church called to weather today’s tempests of godlessness, globalization, materialism, fundamentalism, and individualism. Indeed, Christ the Captain calls us to enter depth and encounter Deep. Isn’t that the same hand that held Peter ever ready to hold you and me? In the middle of a dark winter’s night in a small Midwest farming community, the two-story home of a young family caught fire. Quickly, parents and children followed their well-practiced emergency plan and made their way through the smoke-filled home out into the front yard. There the father quickly counted heads and realized that their 5 year-old son was not among them. Suddenly he heard a wail and looked up to see the boy at his bedroom window, crying and rubbing his eyes. Knowing the danger of re-entering the house to rescue his son, the father called, “Jump, Son! I’ll catch you!” Between sobs, the boy responded to the voice he knew so well. “But, I can’t see you, Daddy!” The father answered with great assurance. “No, Son, you can’t see me, but I can see you! Jump!” At that, the boy jumped into the smoky darkness and found himself safely cradled in his father’s arms. Our scripture today is about trusting – about having faith – about being able to discern the fact that our God is with us. 2: “I have faith in the Lord and He will save me.” (A story about presumptuous faith). In the story of creation found in the Book of Genesis, we read where Adam and Eve had partaken of the forbidden fruit, something which had been specifically denied them. Knowing that God is searching for them, they attempt to hide. It is a scene perhaps reminiscent of many of our childhoods when we had done something that we were not supposed to and we literally hid from our searching parents. Finally God finds them, as we know that He will, for, after all, where can we go to hide from God? God asks them why they are hiding. Do you remember the response that Adam gave: "Because, I was afraid?" I think this very poignant story reminds us that fear is so basic to whom we are as humans, it goes all the way back to the beginning of time. To be human is to experience fear. There seems to be no limit to our fears. In a peanuts cartoon strip Charlie Brown goes to Lucy for a nickels worth of psychiatric help. She proceeds to pinpoint his particular 'fear'. Perhaps, she says, you have hypengyophobia, which is the fear of responsibility. Charlie Brown says no. Well, perhaps you have ailurophobia, which is the fear of cats. No. Well, maybe you have climacophobia, which is the fear of staircases. No. Exasperated, Lucy says well, maybe you have pantophobia, which is the fear of everything. Yes, says Charles, that is the one! Your most beloved things are not always your most perfect things. And your most beloved relationships are not always your most perfect relationships. Remember your "blankie?" Come on now, you all had one. And it was in perfect shape, right? It was the rattiest, most stained, most beat up thing anyone has ever seen. But the condition it was in mattered not a wit at nap time, or bedtime, or cry time. Or what about that stuffed animal? Come on, now. You all had one. And it was in perfect shape, right? No matter how unstuffed your stuffed animal, or how smelly and gross it was, all that mattered was that your special, indispensable friend was within arms' length when you needed a comforter. Isaiah 40:1 offers the ultimate "comfort food" - at least for those of us who have outgrown blankies and stuffed animals but still need to have that comfort moment when we are in the midst of the world's unending maelstrom of misery. Here it is: "Comfort, O comfort my people, says your God." Isaiah 40:1 makes it crystal clear that God is ultimately concerned with healing, not with hurting, humanity. Jesus saw himself in his first coming, not as a judge dispensing justice, but as a physician dispensing healing. (Matthew 9:9-13). "It was at the end of the day. I entered the outer office of his law firm. Everyone had left. All was dark, except for a light coming from the inner office. He called to me. Invited me to come back to his office. "He poured out the drinks, offered me a seat, reared himself back in his chair, feet on the disordered desk before him. "'What sort of day have you had?' I asked. "'Oh, I'm sorry. What was miserable about it?' I asked. "'It's not the sermon that I come for, preacher,' he said, fixing his gaze upon me. 'It's the music. I go a whole week sometimes with nothing beautiful, little good, until Sunday. Sometimes, when that choir sings, it is for me the difference between life and death.'" Why are YOU here? You don't have to answer. The fact that you ARE here is enough. You NEED this ship. We all do. Stay in the boat. Because it is here we hear, "Take heart. It is I; don't be afraid." David E. Leininger, Stay in the Boat! There is a joke concerning this text that has gone around for years about three ministers out fishing together in a small boat. One of them, suddenly realizing that he had left his tackle box in the cabin, stepped out of the boat, and walked on the water over to shore. Just then, the second one said he had forgotten his faithful fishing hat on the front seat of the car. He too stepped out of the boat and walked on the water over to shore. When they had both returned, the third minister who had watched this remarkable demonstration with mouth open and eyes wide, reasoned to himself "My faith is as strong as theirs. I can do that too." So he stepped out of the boat and promptly sank to the bottom. His two companions dragged him out, but once they got him in the boat, he was determined not to be shown up. He stepped out once more, and immediately sank again. As his friends pulled him out, he sputtered, "My faith is as strong as yours. Why can't I walk on the water?" The first two looked at each another and one finally said, "We'd better tell him where those rocks are before he drowns himself." "Do not be afraid." The scriptures make this announcement over and over again. These are usually the first words out of angel's mouths. Abraham, Moses, Mary, Joseph, shepherds tending their flocks, Paul sitting in a jail cell, the women looking for Christ's body at Easter and disciples rowing a boat in the strong wind all hear these words. In all, these words occur almost 100 times in the scriptures. Apparently, humans are very fearful creatures and we are in need of faith to function properly in the world. There is a character in the classic work Don Quixote named Pancho Sanchez. Pancho Sanchez hangs in fear from the ledge of a window all night long, too frightened to let go. When morning dawns he discovers his toes are only an inch off the ground. It's amusing to think of Simon Peter climbing out of the boat trying to imitate his Lord by walking on the water. Then, like a cartoon character, he makes the mistake of looking around. "What in the world am I doing?" he asked himself and suddenly he begins to sink. How often that happens in life. People are charting a successful course in their business, in their marriage, in their walk with Christ, and then they begin to listen to their fears. "What if I fail? What if the market fails? What if my faith is misplaced?" and they begin slowly to sink. This summer, I took part in a chaplaincy program at Crouse hospital, where one of my assigned units was the neonatal intensive care unit. There I watched babies born 1, 2, 3 months early, struggle for their lives, struggle to eat, to breathe, to gain even an ounce. The mothers there, whether they considered themselves religious or not, suddenly found themselves having to rely on faith, suddenly found themselves believing in, hoping for, depending on miracles. It was hard for an outsider, even a chaplain, to understand the kind of faith required in this special nursery. At first I would look at some of the tiniest babies, some of the 1 lb. babies, and try to be realistic. To prepare myself for the grief I might experience, I tried to expect the real possibility that the smallest babies might not make it. I hoped for the best, but I tried to balance my hopes with realism, with the reality confronting me, so that I wouldn't be disappointed if a miracle didn't happen, so that I wouldn't be hurt if I did have to confront sorrow and loss. But the mothers there would tell you that my attitude wasn't what was needed there - they would tell you that no matter what the odds, they had to hope for a miracle, with all their heart, with all the faith they could muster. There was nothing practical about their faith, no consideration for realism in what they dreamed of happening. Perhaps this was the kind of faith Jesus was asking of Peter out on the sea that day. Unbounded faith, unrestrained, unmeasured, uncalculated. Perhaps this is the kind of faith Jesus is asking, demanding, expecting of us. Beth Quick, What Did You/do We Expect? Now I Know Why Jesus Walked! This is a familiar story. Mark Twain refers to it in one of his books. He recalls a visit to the Holy Land and a stay in Capernaum. It was a moonlit night, so he decided to take his wife on a romantic boat ride on the Sea of Galilee. Twain asked a man in a rowboat how much he would charge to take them out on the water. The man saw Twain's white suit, white shoes and white hat and supposed he was a rich Texan. So he said the cost would be twenty-five dollars. Twain walked away as he said, "Now I know why Jesus walked." Even churches can know what it is to walk on the water. Wes Seliger is an unconventional Episcopal clergyman who loves motorcycles. He tells about being in a motorcycle shop one day, drooling over a huge Honda 750 and wishing that he could buy it. A salesman came over and began to talk about his product. He talked about speed, acceleration, excitement, the attention-getting growl of the pipes, racing, risk. He talked about how the good-looking girls would be attracted to anyone riding on such a cycle. Then he discovered that Wes was a minister. It always happens, doesn't it? Immediately the salesman changed his language and even the tone of his voice. He spoke quietly and talked about good mileage and visibility. It was indeed a "practical" vehicle. Wes observed: "Lawnmower salespersons are not surprised to find clergypersons looking at their merchandise; motorcycle salespersons are. Why? Does this tell us something about clergypersons and about the church? Lawnmowers are slow, safe, sane, practical, and middle-class. Motorcycles are fast, dangerous, wild, thrilling." Then Wes asks a question: "Is being a Christian more like mowing a lawn or like riding a motorcycle? Is the Christian life safe and sound or dangerous and exciting?" He concludes, "The common image of the church is pure lawnmower--slow, deliberate, plodding. Our task is to take the church out on the open road, give it the gas, and see what the old baby will do!" Is our church a lawn mower church or a motorcycle church? Maybe it's time we took more risks for God. "Miracles are not a contradiction of nature. They are only in contradiction to what we know of nature." Alexander Solzhenitsyn said that only once during his long imprisonment in a labor camp in the Soviet Union did he become so discouraged that he thought about suicide. He was outdoors, on a work detail, and he had reached a point where he no longer cared whether he lived or died. When he had a break, he sat down, and a stranger sat beside him, someone he had never seen before and would never see again. For no apparent reason, this stranger took a stick and drew a cross on the ground. Solzhenitsyn sat and stared at that cross for a long while. He later wrote, "Staring at that cross, I realized that therein lies freedom." At that point - in the midst of a storm - he received new courage and the will to live. The storm didn’t end that day, but through our Lord, Jesus Christ, Solzhenitsyn found the strength to ride it out. I don’t know what storm of life will come your way this week, or what storm you may be enduring at this very moment. But I know this: even as the storm rages around you, if you will listen very carefully with your heart, you will hear a gentle voice calling to you, “Take heart, it is I; do not be afraid.”(Mark 6:50) And in time the storm will pass. And our Lord, God, and Savior, Jesus Christ, will still be there. A. Fear not! Fear Not! 1. First, we must confront our fears. 2. Second, we must understand that too much doubt can sink us. 3. Third, we must remember that regardless of what happens, God will be with us. 3. The mystery of the apostle Peter who walked on the water and whom Jesus saved by taking by the hand. Let us prepare ourselves to celebrate these mysteries. With the apostle Peter we recognize that we are all sinners and that we are not worthy to approach the Lord. So we implore his help as we cry to him: Lord, save us! We do not know how to be silent in our lives in order to recognize your passage. Lord, save us! We sometimes doubt your love when the boat of our life is beaten by waves. Lord, save us! We sometimes forget your presence when the wind of passion rises in our hearts. Lord, save us! May Jesus Christ our Lord, who saved his apostle Peter by taking him by the hand, save us from the waves of sin. May he forgive us our faults and bring us to eternal life. Today still, as in the time of the Gospel, Peter's boat is tossed about in the storm. Let us pray that the Lord may keep it under the protection of his love. That, like the prophet Elijah, we may go to meet the Lord and we may recognize his passage. That, in our everyday lives, love and truth may meet; justice and peace may embrace. For the people of Israel, of whom the Messiah was born according to the flesh. That they may recognize in Jesus their Messiah, the God who is eternally blessed. That, in imitation of Jesus, we may know how to withdraw in solitude sometimes and collect our thoughts in prayer. and think that they see phantoms everywhere. May they hear the word of Jesus who says to them: "Have confidence! It is I. Do not be afraid!" 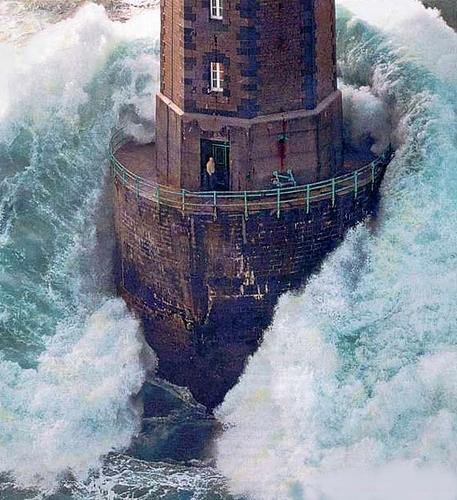 For those who are afraid that they will founder like Peter in the midst of the waves. May they seize the hand that Jesus extends to save them. Each time the Lord comes to us in the events of our lives, may we prostrate ourselves before him while saying with the apostles: "Truly, you are the Son of God." Let us pray also for all our other intentions. God of our forefathers and mothers and the God of Jesus Christ, Saviour of Elijah, of Israel, of Peter: Take us by the hand, lead us into your Kingdom, and watch over us for ever and ever. In you, Lord Jesus, love and truth have met; justice and peace have embraced. We pray to you now: Make every moment of our lives reveal your mystery of love and of truth, of justice and of peace, to the glory of your Father. During World War II, in London there was a blitz bombing at night. The people stayed each night in underground protection. But one Christian lady just stayed at home and slept through all the bombing. When asked about it, she said, "Well, my God neither slumbers nor sleeps, and there's no need for both of us to stay awake!" 1) Storms reveal to us the true source of our strength. It is the presence of Jesus which gives us peace even in the wildest storms of life: storms of sorrow, storms of doubt, tension and uncertainty, storms of anxiety and worries, storms of anger and despair, storms of temptations. Storms reveal our inability to save ourselves and point us to the infinite ability of God to save us. When Jesus shows up in our life’s storms, we find that we gain strength to do the seemingly impossible. For example, when Jesus shows up he makes marriages out of mistakes, he invigorates, restores, and empowers us to reach the unreachable, to cross the un-crossable. Storms let us know that without him, we can do nothing, without him we are doomed to fail. Yet, when Jesus shows up, we gain the strength to join Paul, saying, “In Christ I can do all things.” But this demands a personal relationship with God, with Jesus, enhanced through prayer, meditative study of scripture and active sacramental life. 2) Don’t put limits to God’s presence: There are those who would limit God’s presence for their own comfort or security or to keep themselves in power. In years past there were those who would deny God’s presence in slaves. There have been those who would ignore God’s presence in their enemies. There are those who would refuse to believe that God is present in the murderer sitting on death row, in those who are marginalized by our society: the gay person, the addict, the person living with AIDS, the illegal alien, the handicapped. It is in situations like these that we have to get out of the boat, surprise the others and show them the reflection of God in such people. Let us always look for the ways to be surprised by our God and the opportunities to wake one another up to the beauty, the power and the nearness of our loving, providing and protecting God. When we reflect on our faith, we often under­stand it in terms of our belief in the teachings of Christ. We normally include in it also what­ever the Church teaches us in his name. But faith in Christ means certainly much more than these things. On the day of our Baptism, the Spirit gave us the light to understand Jesus' teachings, and added to that light, a trust in his power and goodness, and a convic­tion of his closeness to us. This trust and con­viction prompts us to abandon ourselves into Jesus' hands, come what may, in life. Faith means precisely this: an abandoning of ourselves into the hands of the Risen Lord; it means to put our trust in his power and in his goodness. This faith in Christ can be compared to a seed, which God plants in our heart. It sprouts at Baptism, and under the influence of the Spirit within us, grows into a tree. Our task in this world is to see to it that it keeps growing throughout life, yields fruits of love, and eventually, brings forth eternal life at our death. But our faith is threatened throughout our lives. The readings of today, particularly the Gospel, give us precious advice as to how to behave when our faith in Christ is endangered. Whenever we get upset for something, it will always be because we fail to recognize Jesus in the events or persons that upset us. Nothing ever happens in our life in which God does not have a hand, sin excepted. "Courage! It is I! Do not be afraid!" What a tremendous power and encouragement these words of Jesus contain...! The trouble is that we do not stop to listen to them in the midst of our worries. 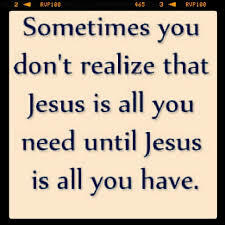 And yet Jesus always "walks towards us" whenever we are in trouble; he is never far from us. (Balloons story; Sept 22, 2001 in Chicago emigration). Let us not misunderstand the Gospel; it is not that all trouble cease once Jesus is with us; what Jesus calms down first of all is the storm within our own heart, helping us to accept God's plans with joy. Then our progress towards heaven "the place we are making for" becomes a fast progress. We shall be there in 'no time' and that should give us further courage in the struggle, and in­crease our trust in Jesus." Trust in the Father in the Midst of the Storm One night a house caught fire and a young boy was forced to flee to the roof. The father stood on the ground below with outstretched arms, calling to his son, "Jump! I'll catch you." He knew the boy had to jump to save his life. All the boy could see, however, was flame, smoke, and blackness. As can be imagined, he was afraid to leave the roof. His father kept yelling: "Jump! I will catch you." But the boy protested, "Daddy, I can't see you." The father replied, "But I can see you and that's all that matters." You made yourself known of old to Elijah in the light breeze. You make yourself known today to us in this Eucharist. Blessed are you, 0 Lord! You made a Covenant of old with Israel. You make a Covenant today with us in this Eucharist. Of old you saved Peter by taking him by the hand. Still today you save us in this Eucharist. God of our fathers and Father of Jesus Christ, Saviour of Elijah, of Israel, of Peter: Take us by the hand, lead us into your Kingdom, and watch over us for ever and ever. Truly You are the Son of God. I bow down and worship You in because You have revealed Your glory to me during the storms of my soul. Gigantic waves of sin and suffering buffet me. Howling gusts of doubt and distress threaten to disturb my peace. My distorted night vision is terrifying. Fear of the unknown and unseen cripples me. Through the dismal darkness of a restless night, I long to hear Your voice calling me to “Come.” I want boldness and courage to be like Peter. While the other eleven sat in the boat paralyzed by panic, Peter recognized Your voice and took a giant leap forward. With my eyes fixed on You, I too will step out of my comfort zone to accomplish the impossible. Please give me faith to focus on You, forgetting the fierce waves and ferocious wind. Forgive me for all the times I’ve fearfully stayed in the boat and missed divine endeavors. I’m sorry for the times I was skeptical of Your power, presence and provision. Even in my faithlessness, please graciously reach out and save me! Do you hear the Voice in the night calling you to “Come?” Will you risk stepping out of the boat or remain in the boat gripped with fear? I encourage you to fix your eyes on Jesus and step out in faith. With your eyes fixed on him, He will give you the power to walk on water through your fearsome storm too. An Indian woman in her ninth month of pregnancy has swum a river swollen by monsoon rain to give birth in hospital. She said she was "scared" but wanted her baby born safely - there is no medical centre in her village and she did not want to give birth at home. Villagers and doctors have described her swim as an amazing achievement. Yellavva, 22, is a resident of Neelakantarayanagadde, a small island-village on the Krishna river in Yadgir district, some 400km (250 miles) north of Bangalore. The only way to travel from there to the mainland is by a raft - which doesn't operate when the river is too choppy. "I was scared. 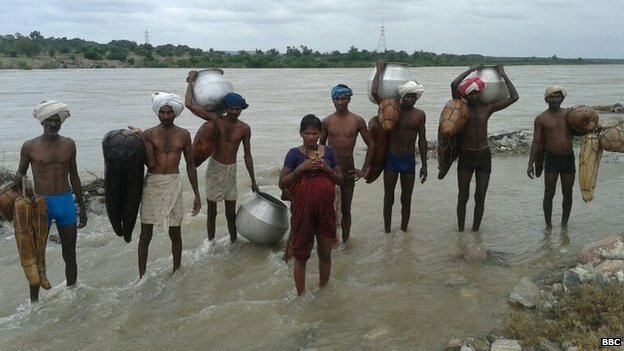 But it was for my child that I got the determination to get over all my fear and cross the rising river waters," she told BBC Hindi. "My brother went in front. I was next. My brother and cousins had tied dried hollowed pumpkin and bottle gourds around me so I was afloat," she said. Her brother Lakshman, who held on to the rope tied to the gourds and pumpkins, said: "My father was right behind her. Normally, the distance is a little more than half a kilometre. But, it took us about an hour to get her across. As we reached mid-point, the current was very very strong." Yellavva said the swim made her tired, but a doctor who examined her on arrival at the government medical centre in the nearby village of Kekkera said "she is fine and resting at a relative's home". "Her baby, due in 20 to 25 days, is fine too," Dr Veena said. Yellavva's daring swim has won her much praise. "I have been here for seven years. A handful of people have crossed the river with some help. However, I have not seen any pregnant woman crossing the river when it is in this state and that too in the ninth month of pregnancy," Dr Veena said. "She is an example of courage and determination. The first thing that struck me when I took her photograph was that she was so determined to cross the river in spate," said Venkatesh Dore, a reporter for a local newspaper who took Yellavva's photo.